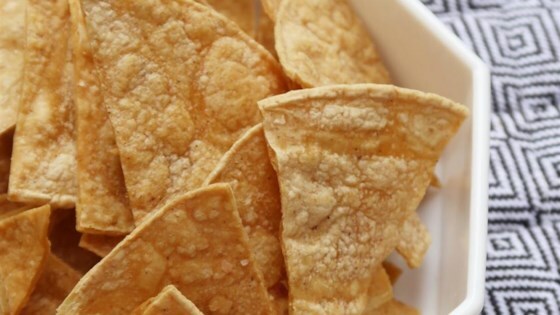 "Tasty baked tortilla chips you make at home that are much better than store bought chips. Serve with your choice of salsas and garnishes." i only baked them for 13 minutes, but in the end, it still came out slightly burnt, and was very dry. i had to throw them away. This is an easy recipe to make and very good with some salsa. I used olive oil instead, but that was the only change I made. Very good and better for you than store bought chips. I didn't have limes, so I just sprayed on olive oil. I also added some seasoned salt instead of regular salt. Delicious!